The big winners in this disruption are going to be electric vehicle manufacturers because the reality is that 95% of the trips people take in cars can be handled by electric vehicles equipped with current battery technology1 and the three main drawbacks of electric vehicles (initial purchase cost, range and recharging time) will all be negated by The Mobility Cloud. The moderately higher purchase cost of an electric vehicle will be become inconsequential because in this usage model, now the vehicle’s purchase price is being amortized over tens of thousands of users over the useful life of that vehicle and that modest difference in initial cost becomes irrelevant. Keep in mind these shared vehicles are now operating as cabs and consequently will be doing ~70K miles per year2 rather than the 13.5K miles per year3 that private automobiles do on average. So what matters now is running costs, and running costs for electric vehicles are so much lower than gas vehicles that in terms of real dollars to the consumer and fleet manager, the electric vehicle will be much cheaper to operate than gasoline vehicles. 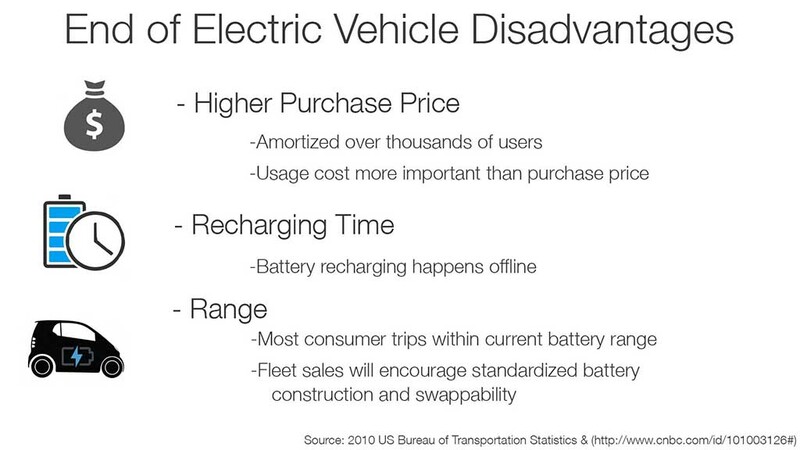 The charging time problem is eliminated because the consumer is only using the vehicle for the duration of one trip. He doesn’t have to worry about how long it takes for the battery to charge offline because the consumer has no exposure to that. The consumer won’t even be using the same vehicle for his return trip. The range problem is also largely eliminated for the same reason as the charging time problem. As long as the consumer’s one way trip is within the range of the electric vehicle, and 95% of trips4 fit that profile, range doesn’t affect the consumer. The range and the recharging time are the fleet provider’s responsibility to manage, not the consumer’s. So there’s now a situation where not only has The Mobility Cloud removed the primary barriers to consumers choosing electric vehicles, but electric vehicles are now able to significantly undercut gasoline vehicles fiscally almost from day one, which has never been the case before. There’s no need for subsidies or incentives to sell electric vehicles anymore because they’re economically and functionally superior to gasoline vehicles on their own. It’s easy for naysayers to claim that will never happen because electric cars only constitute less than one percent of the market and they’ll never catch up, but that’s a linear claim in an exponential system. To see see a more quantitative demonstration of the benefits of electric vehicles in the The Mobility Cloud go on to the next section.